Happy 83rd Birthday to Willie Hugh Nelson! Here's wishing Willie many more years of good health and recording and performing. He is a national treasure, one of the last of a dying breed, and his work is much appreciated. I'm going to cheat a little bit here and link a video of Glen Campbell performing "Gentle On My Mind". But...but...but...Willie and Waylon are present and one of the most touching moments of the video is seeing the expression on Willie's face as he admires Glen's guitar solo. And, with Chet Atkins and Roy Clark also in the audience, I'd say there's a little bit of guitar talent on hand. Oh yeah, you're talking about Trigger! That has to be one of if not the most iconic guitar in the business. It sounds exactly like Willie (and vice versa). Most of the Highwaymen turned up on Glen's tv show at some point; Waylon was on there probably around the same time as Willie, and there's a very memorable all country episode with John, Buck Owens and Merle Haggard. The network told Glen "that show was too country!" Typical network buffoons. I saw Willie live a few years ago, we're in this big convention center with probably 4,000 people there, and before the show, they had Trigger sitting out at the edge of the stage, unattended. Basically there were rednecks 5 feet from the guitar. We kept talking about how dangerous that was, the guitar's priceless and anybody could have grabbed it and probably got the hell out of there before anybody caught them. Rocker, thanks for the Brian Wilson-Kris Kristofferson link. I had completely forgotten about that performance. It's kind of interesting but you have two of the greatest songwriters ever, and I don't think either one has recorded or performed any of each other's songs. Lonely Summer, I know the exact clip you are talking about with the Glen, Johnny, Buck, and Merle performance on Glen's TV show. I believe Mel Tillis, June Carter Cash, and Minnie Pearl were on it, too. I'll keep scouring YouTube for it! Ron, I have a funny Willie Nelson story. A few years ago, I saw Willie open for Bob Dylan in Bethlehem, PA. It was outdoors and the skies were sunny but fast becoming cloudy. Willie came on and kept looking up at the sky as it became darker and darker. Eventually the sky was almost black and lightning as a thunderstorm was fast approaching. Willie was about half way through his set and all of a sudden he went into fast speed. There were obviously a few classics he wanted to perform yet, so he went into these super fast versions of "I Saw The Light", "Always On My Mind", and the closer, "On The Road Again". Imagine turning the speed up on a turntable - that's what the songs sounded like. It was almost funny as it was obvious what Willie was doing, and you kind of appreciated it because those songs were important to the audience, and he wanted to get them in. What was funny was that Willie quickly finished the set, the rain hadn't started yet, and Willie didn't want to leave the stage. He kept walking from one side of the side of the stage to the other, waving and throwing things like his hat, bandana, and guitar pick into the audience. He didn't want to cheat anybody. Anyway, it eventually poured for about a half an hour, stopped, and Dylan performed. Which reminds me once more of what could've been a really cool project... Stars&Stripes. My alternate Tracklist features a.o. Kris Kristofferson doing "Forever" or even "Thoughts of you"
I mentioned it somewhere in the country-thread IIRC, that song (along with George Jones' Radio Lover) is the very first song I can distintcly remember hearing in my life. "Fifteen years on, in late 1984, Cash convened the group that would become The Highwaymen while recording a Christmas special in Montreux, Switzerland. A little over a year after that, he released a new "One Too Many Mornings" on his album Heroes with newly-minted Highwayman Waylon Jennings. (The album is notable for, among other things, its cover art figuring the two singers as gunslingers.) 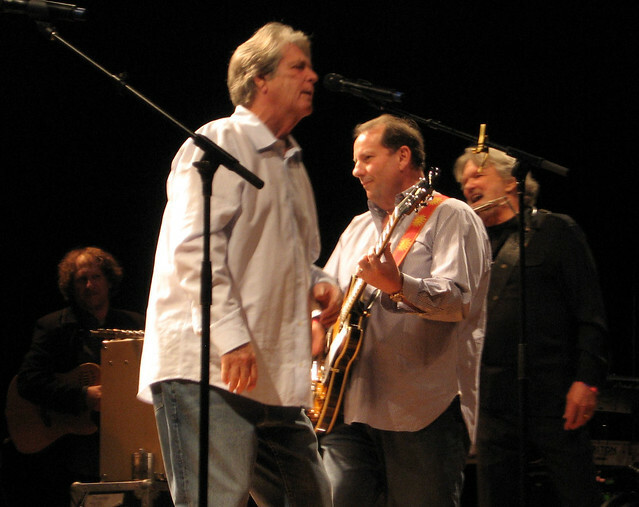 In 2014, 11 years after Cash's death, Nelson and Kristofferson — who'd been left at the side of the road for the Heroes version — added their own vocals to the track. That version is now seeing light, thanks to the upcoming box set Live: American Outlaws." The 10th anniversary edition of "The road goes on forever" had an unreleased studio cut with "If he came back again" (a song about Hank Williams sr.) and if I'm not mistaken the new set has another one with "One too many mornings". But since Cash and Waylon recorded a version on their "Heroes" album this might be just the old recording with Kris and Willie adding new vocal tracks. This is just a guess, I haven't heard anything about it. Of course it might well be a genuine outtake. I hope he has that instrument insured! Willie did a song maybe 6, 12 months back called 'I woke up still not dead again today' after the hoaxes that were going round. around, but I've been looking for the film clip and studio (bus studio) version of it. do you know anymore about this and why it's no longer on youtube? It's a great funny song, and SO 'willie'. Apparently the video has been pulled, which is weird because it was originally published by Willie’s Official YouTube channel. Perhaps they decided to get the song ready for sale. Stay tuned. Powered by SMF 1.1.21 | SMF © 2015, Simple Machines Page created in 0.265 seconds with 21 queries.